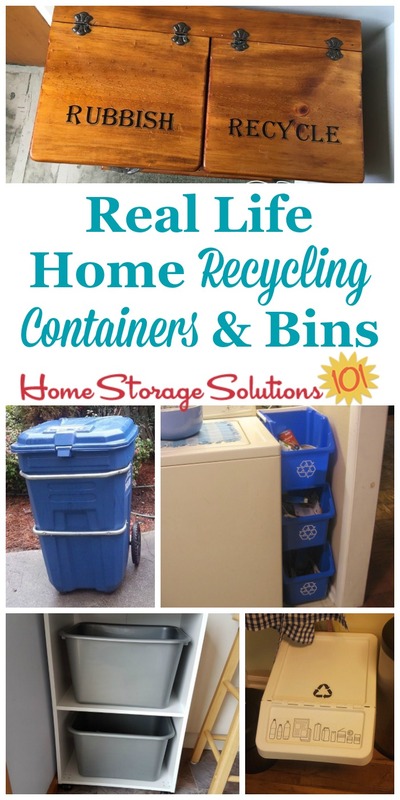 Do you have home recycling containers throughout your house? That was one of the tasks in the 52 Weeks to an Organized Home Challenge, which asked everyone to create a home recycling center. Lots of people took this challenge, or wanted to show off the containers and bins they had already placed in their home, so I've actually created this second part of the hall of fame. I hope you enjoy the pictures and ideas from readers below (scroll down to see them all). If you get inspired to set up your own home recycling center, I suggest you follow the steps in the challenge (see the link above). 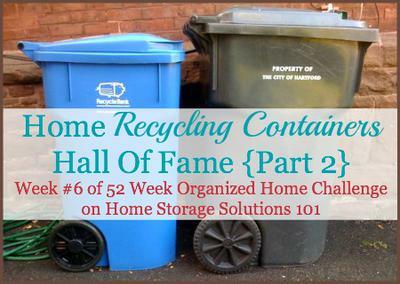 Be sure to take pictures of your bins and containers, both inside or outside your home, and send them in and the best ones will be featured in the Home Organization Hall of Fame! Finally Set Up Our Recycling Station! Paula sent in the photo above, and she said, "We finally set up our recycling station. We got the white box at IKEA for $12.99 and the stickers for 50 cents. I have no before pictures, just imagine a trash bag under the sink!" 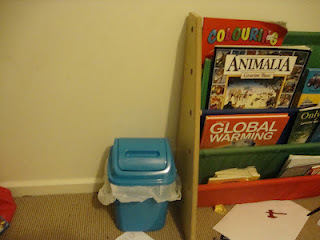 Here's another photo of a simple recycling station, as well as the place to collect trash, sent in by a reader, Linda. 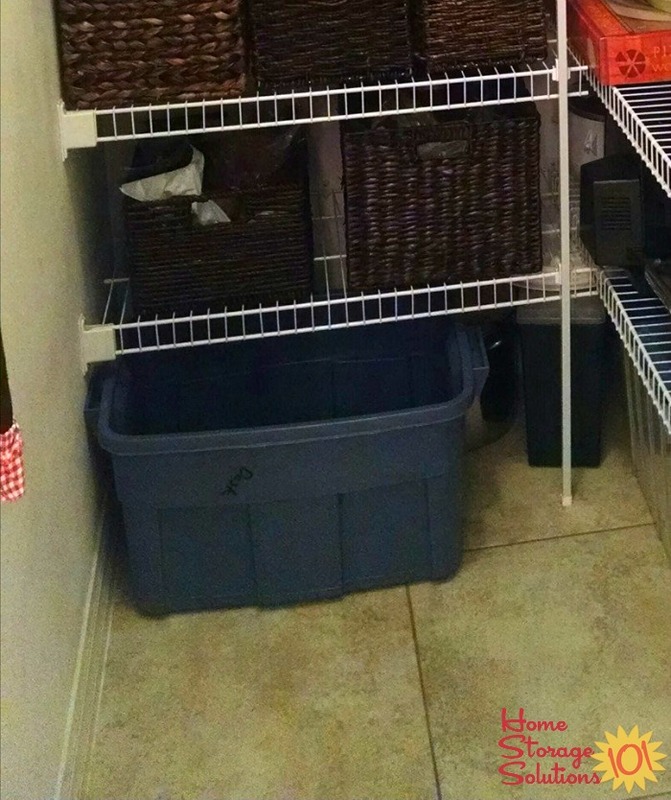 You need to choose bins or containers that work in the space you've got on hand, which is exactly what a reader, Barbara, did when she found these stackable bins that worked in her laundry room. 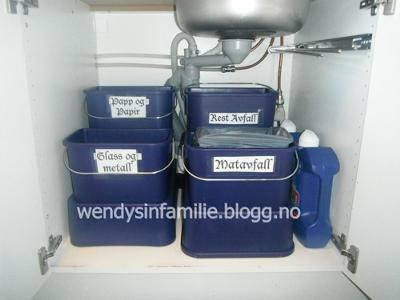 Here's a blog post from Wendysinfamilie.blogg.no who is following along with the challenges, and also worked on her home recycling center. 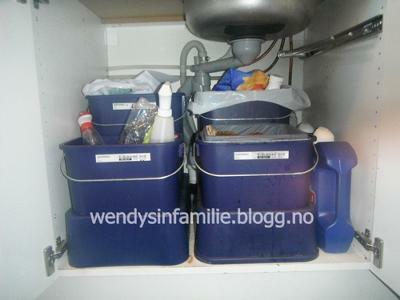 I couldn't read the blog words, since I only speak English, but you can tell she has her recycling held under her sink. She already had everything separated out with different containers under there, but during the challenge she took the time to create some labels for them. 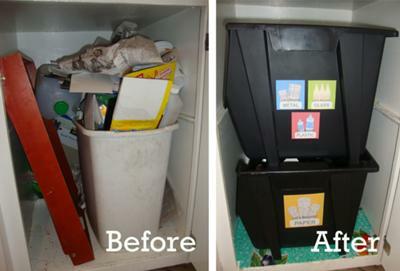 Tricia shared how she improved the way her family recycles, even in a really tight space. Our home is small and 100 years old. As a result, I need to maximize every inch in our home by being really organized. For the recycling challenge, I was working with a small cabinet (20 inches deep, 16 inches wide, 27 inches high). Our previous “system” (an old trashcan that fit the space but overflowed within two days) was really driving my husband crazy. 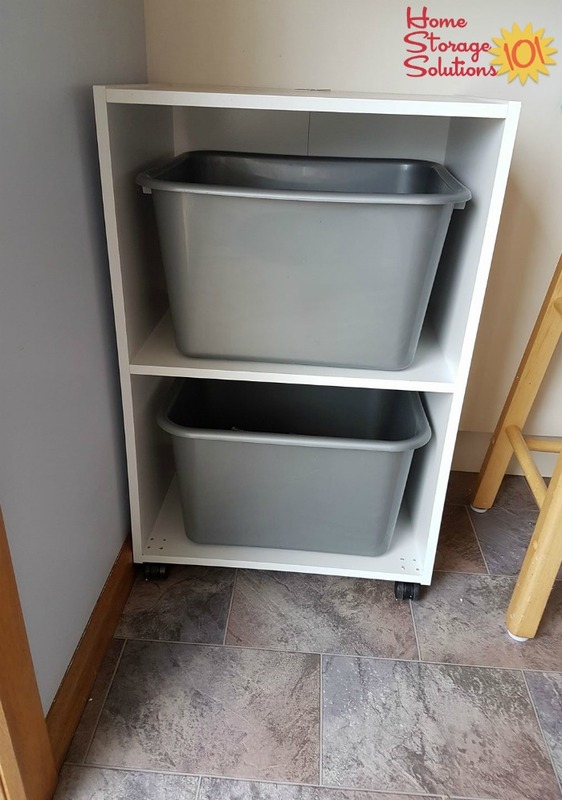 For the challenge, I purchased two new bins. 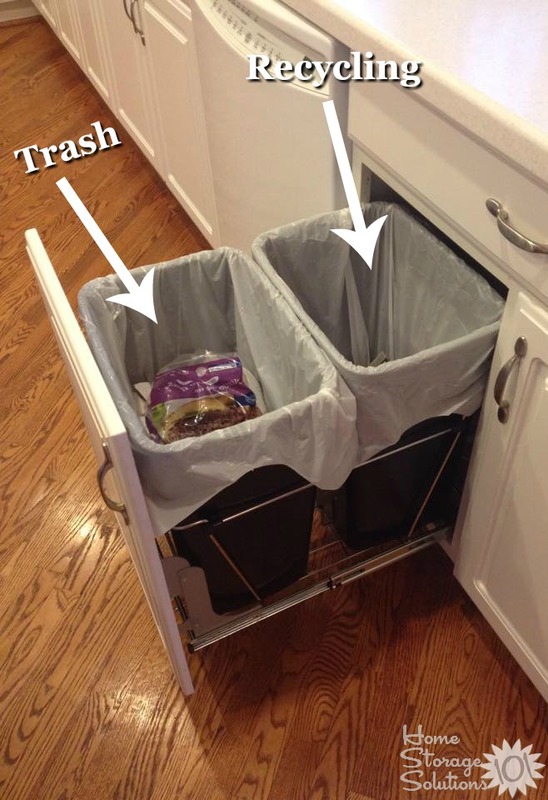 Due to the narrow width of my cabinet, the bins need to be pulled out for use, but they work fine. I made cute stickers to identify each bin for my kids and put down Mexican oil cloth for easy cleaning for the inevitable schmutz that gets on the bottom of the cabinet. My husband is really happy with the change, so this is a win/win on the home front! Thanks Tricia for sharing your picture and tips for what you did. It sounds like you really thought it through, and worked with the space you have. 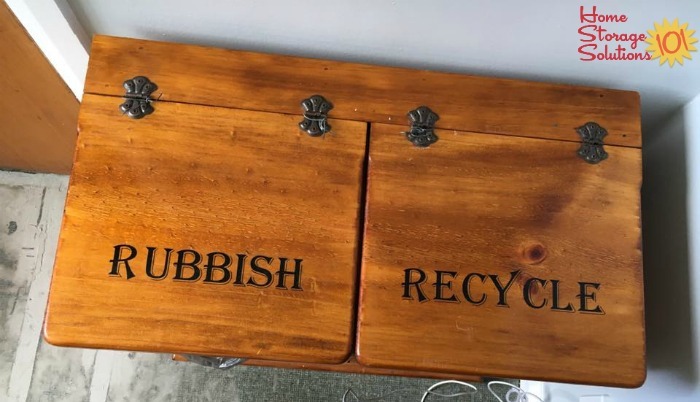 Yes, it is a definite improvement, and the labels and the protection for the floor of the cabinet are nice touches that will help you use and enjoy your recycling center even more. Brava! 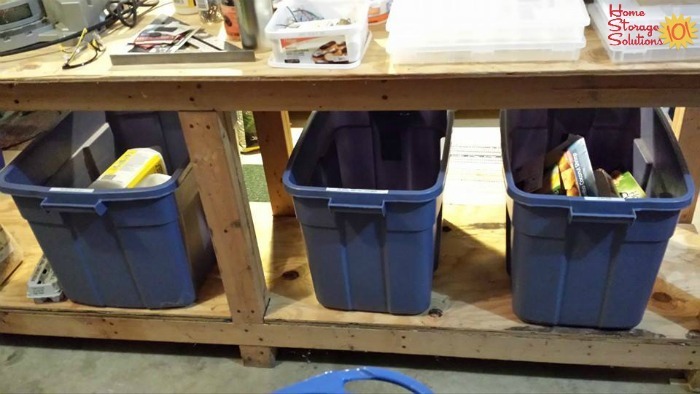 Here's another photo sent in by another reader, Helena, who also used this challenge to get her recycling station organized. Helena said, "Finally got my recycling centre sorted. It's on wheels for ease of moving when needed." Ferris from The Hamman Family Blog shared her before and after pictures from this challenge. 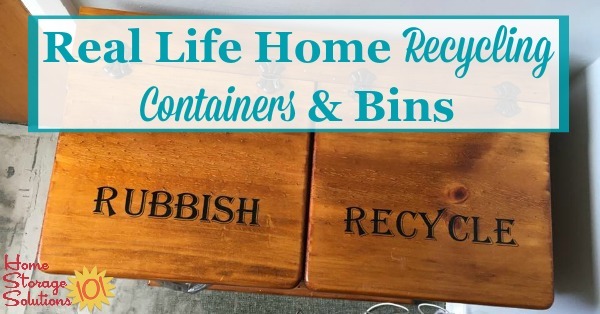 She explained in her blog post that her family didn't need lots of bins because their area had what is called a single stream recycling system, where all recyclables are collected together instead of having to be separated. However, she does separate her aluminum cans since she gives those to someone to recycle where they then use the money for charity. 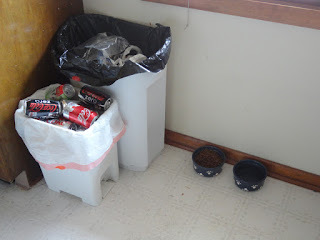 Point is, however, that she didn't need an elaborate system, and she just had to add one bin for additional recyclables, next to her trash can and the bin she collects the cans in. A step she wanted to accomplish that is not shown in the pictures however, is to label each container, with "trash only," "cans only," and "recyclables" so that everyone knew what went where. That's a good point. 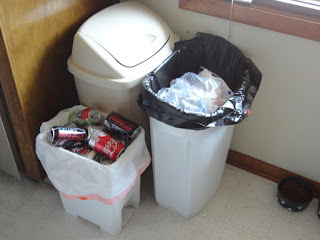 I've been confused as a guest in people's home sometimes as to where the trash versus the recycling is, or what recycling can go where. A little bit of labeling can help both guests and forgetful family members. A vinyl decal, such as the one shown on the right, might just do the trick as a simple label if you've got two similar containers next to each other, so everyone knows where to put the right items. 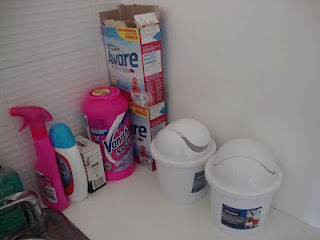 Here's another example from a reader, Heather, who has single stream recycling, and therefore only needed one bin. Heather said, "I've had a pull out trash can I got at Lowes. They come in several sizes and use your existing cabinetry. Trash in front and recycling in back!" You can choose the hardware and parts to allow you to have either a single, or a double can within your kitchen cabinets. 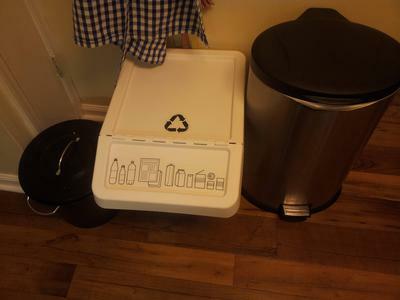 Above is a photo from a reader, Virginia, who also has a single stream recycling system in her area. She said, "We have curbside recycling weekly that doesn't need to be sorted. I gather daily items in a tote in my pantry and empty when full (mostly over-ful!!)" 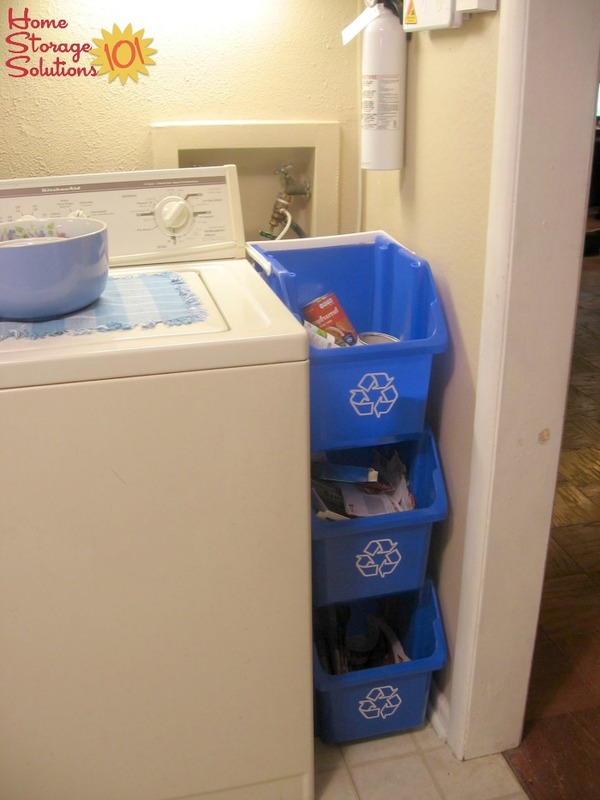 Kelly sent in the photo above of her recycling center, which she set up in her garage. She said, "I finally labeled the bins in the garage: paper, plastic#1&2, and metal, glass, other. We do not have curbside pickup, but fortunately live about two miles from a recycle collection center. We drop items off about every 3 weeks." Not everyone keeps their recycling bins indoors, at least not some of the big ones. 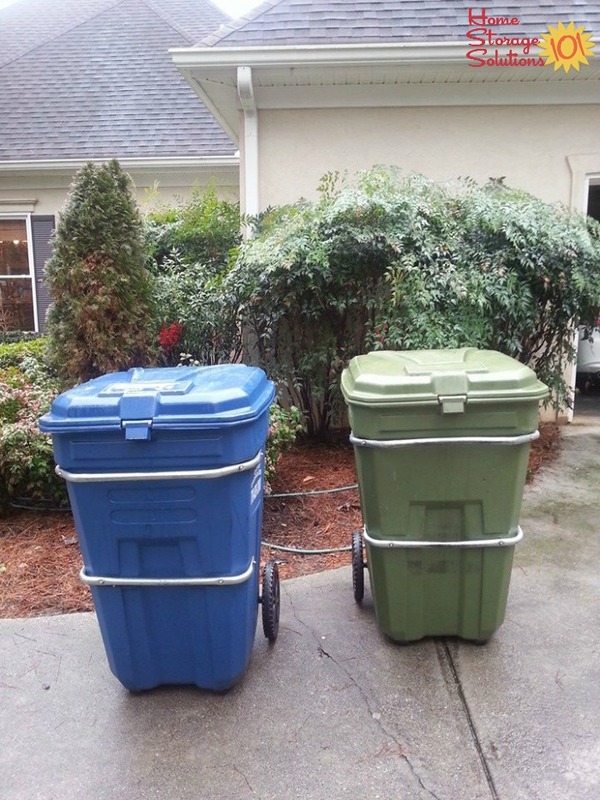 Here are some photos from readers who showed their outdoor bins and containers. The photo above is from a reader, Mary. She said, "Our rather small Georgia town has a wonderful curb-side recycling program. For a one time rental fee of $25 you have a large blue recycling container. The green is for other garbage. I keep a smaller container in the garage and empty that into the big blue every few days. The county also has recycling centers for those outside the city limit pick up." 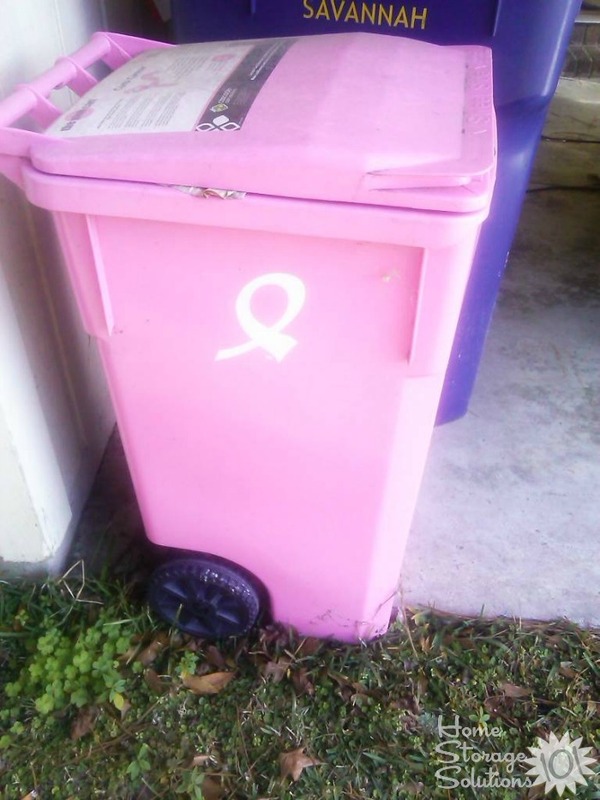 A similar photo was also sent in, above, by another reader, Annmarie, who said, "We pay for our recycling, only one trash collection company collects recycling and it is $5 a month that is donated to one of the breast cancer organizations. They take paper, cardboard, cans and some plastics. I get the plastics confused but I'm pretty sure water bottles and milk jugs. We keep it next to the kitchen exit door and carry it to the bin as needed. There is also a recycle drop off about a mile away that takes glass and wood as well. There are two of us and our normal trash works out to less than a standard white kitchen bag a week." Bec from 2012 - The Year of Challenges did the steps of this week's challenge, and showed off her handy work. First, she already had her recycling containers in her kitchen, next to the refrigerator. That was a nice way to use up some otherwise wasted space! Then, she also made sure she placed trash cans in every room of the house, to keep trash from accumulating and piling up so much. 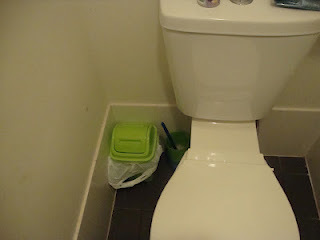 She got cute little trash cans for the bathroom, laundry room and kids' rooms, for example. I thought her idea for the laundry room trash cans was especially good. She got two trash cans. One for lint and other trash accumulated and created in the room. However, the other trash can was used to collect stuff that she found in her family's pockets as she did the wash.
Have You Been Inspired To Get Organized Now? 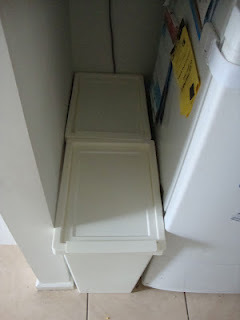 I hope these pictures and ideas have helped inspire you to create and maintain a place in your home for your recycling. If you've been inspired I encourage you to do the steps in week #6 of the challenge all about trash and recycling, and then share your photos with me here. I'd love to feature you in the hall of fame too! Once you've done the challenge you can submit your accomplishments here and I'll add the best ones to the site! Further, as you may be able to tell this is just one of the many parts of the 52 Week Organized Home Challenge here on the site. I'd love it if you joined the challenges because over the course of the year it can help you organize your entire house, from top to bottom. My one smart move was putting an additional tall trash can under our entry shelf to receive all the junk mail right when it comes in the door. It is also conveniently located for desk/crafts/school paper waste. I like the idea of a small recycling container in each room, since packaging, tags, and other paper sometimes ends up in bedroom trash cans. (I do hang a plastic shopping bag on the bathroom doorknob for TP tubes.) What I still haven't figured out is the kitchen recycling bins (and compost), which are almost always full. We have very limited indoor space, so emptying them outside needs to happen regularly but is a real pain in winter. Thanks for giving me ideas to think about while I go put on my boots and empty those silly bins! Hello, I have a small, 2 bedroom, low income, type apartment, I rent in a small town. I need advice on containers to use, and places to store container for recycling. My biggest issue is the dump/recycle center in my town is only open on Tuesday & Saturdays. My next biggest issue is I can't drive, so I would have to go with my parents to the dump/recycling center. My parents only go to the dump/recycling center once a month. Because of the fact that I would only be able to get to the dump/recycling center once a month, I would end up having a ton of stuff to recycle. My biggest issue is, I don't have a lot of space where I live, so I need to figure out a system that would work in my small apartment. Also I have a small porch, but I am not allowed to store anything on my porch except porch furniture. Any tips or ideas would be helpful. Thanks. Why can't I find kitchen green bins that match decor? Like stainless or colours. This is probably years too late, but one suggestion would be to request a bin from your recycling center (a phone call should do the trick). In "Zero Waste Home", she got her trash down to a quart canning jar a year! Saved 40% on household expenses too. I live in a studio apartment, so my bins are dollar tree specials. I have them on a shelf in the pantry, paper, plastic and aluminum are in one green trash can in the kitchen. Garbage is in a small closed container under the sink. Another paper recycle container is a wicker basket next to where I open mail. I recycle weekly for most of it at the apartment recycle bin and take glass, metal and cardboard off-site once a month at least, sometimes more often, if I have large cardboard boxes. 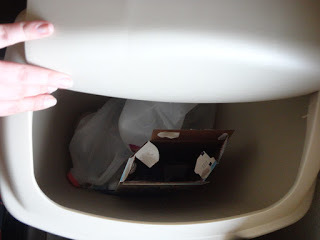 plan to put a recycle bin inside door in bathroom. how about a porch appropriate hassock with storage inside? Also, we keep our recyclables inside so I wash them or let the dishwasher do it ( but be sure no labels in dw!). Then I nest anything I can to save space. In Germany, we have had to recycle for many years and have loads of tons (blue for paper, green for compostibles, grey for general waste), yellow bags (plastic/metal)for home use as well as recycling centres for glass, dangerous things etc etc. Compostibles are emptied every fortnight, paper and general waste every four weeks and the yellow bags every fortnight, the same week as paper or compostibles. We have to use returnables bottles for more and more products. I usually buy glass bottles because they are cleaned and can be reused longer than plastic bottles. So interesting to see all your lovely ideas for all sorts of things!